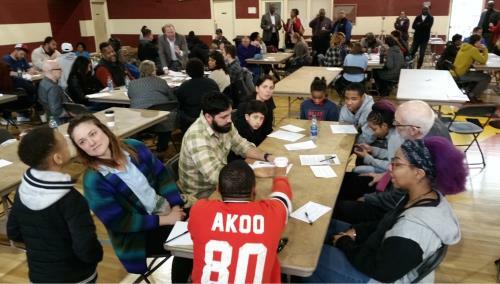 A coalition met Saturday at Hope for the Inner City to build support for a Community Benefits Agreement (CBA) for the development of land on Roanoke Avenue. The property is owned by the city and has been vacant since the Harriet Tubman Homes, 440 public housing units, were demolished in 2014. 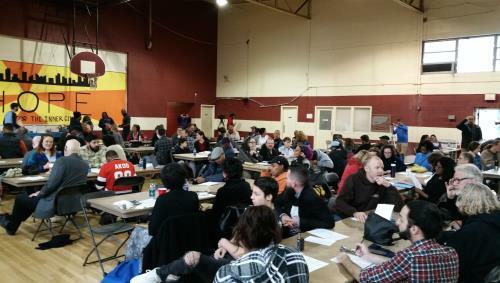 Residents, representatives from the seven coalition member groups, and other community stakeholders met across the street from the property to learn about the components of a CBA. Used as a tool to hold developers accountable to the community, a CBA is typically advanced by a coalition after assessing and analyzing the priorities of the people who will be most impacted by the development. The coalition is composed of Hope for the Inner City, Unity Group of Chattanooga, Chattanooga Organized for Action, Chattanooga Area Labor Council, Glass House Collective, Urban League of Greater Chattanooga, and Accountability for Taxpayer Money. During the introductions there was talk of working together for the greater good. To explain the process to produce a CBA, Anne Barnett, Campaign & Community Coordinator of Central Labor Council in Nashville, was invited to talk about the CBA that was signed regarding a stadium on Labor Day, 2018. According to the coalition’s website Stand Up Nashville is a coalition of community organizations and labor unions that represent the working people of Nashville who have seen our city transformed by development, but have not shared in the benefits of that growth. We believe that development and growth are an opportunity to invest and strengthen all of our local communities. The project that spurred the group to action was the Major League Soccer (MLS) stadium that was being planned for Nashville. The city proposed a 99-year lease, the developers would keep all profits, plus the city offered a gift of 10 acres of land that could be developed as the developers wished. According to Ms. Barnett, when the Metro Council took out bonds for the costs of rezoning and demolition, Stand Up Nashville met with council members about a CBA. 31 of 40 Nashville council members signed a letter that they would not vote yes on all aspects of the plan unless there was a CBA in effect with Stand Up Nashville. Some of the benefits to the community that were secured by Stand Up Nashville were commitments for a wage of $15.50 for stadium employees, at least 20 percent of housing stock would be affordable, and there would be a focus on Minority Business Participation for construction and concessions. Targeted Promise Zone Hiring would not just mean that local applications would be on the top of the pile. Barnett said that a position would be created to focus on recruiting employees locally as a priority, so that money would be kept locally, that it would benefit people in the area. “Not just an abstract program, an actual plan,” said Ms. Barnett. Creating the CBA is a work in progress. Dr. Holmes explained how facilitators were seated around the room to guide conversations about what could be developed on this large piece of land. “This is what I call community engagement. I see some young people here. We have youth in the room, please get their input. We are trying to put together a 10-year plan. These will be the adults. I may not even be around. Make sure you get youth input, as well as Seniors…We need your input. Let’s get moving!” Groups were given 20 minutes to brainstorm. One representative from each table was asked to present the information to the room. In January, the 44-acre property on Roanoke Avenue was rezoned to M-1 industrial. This is the broadest level of industrial zoning and gives the opportunity for a variety of businesses and buildings to be placed in the neighborhood. There is a condition that the site cannot be used for a poultry processing plant. However, that leaves open a lot of options. There were many suggestions reported to the gathering. Some ideas were concrete ideas such as a supermarket, day care, pharmacy, bank, covered bus stop, artists’ space, and a community garden. Other recommendations made had to do with other elements: no pollution production; numbers of jobs spelled out in the CBA with a claw back option if numbers were not met; apprenticeship programs, minority/unionized contractors, and a facility that valued jobs for people more highly than automation.